The first phase of the Osage Nation Master Plan is well underway and is projected to be complete in March 2015. 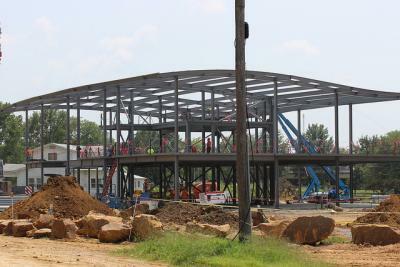 Currently, the structure of what will be the Osage Nation Police Department and other offices has been raised and construction continues on the other facets of the plan. “For Phase One, we are under contract to complete two structures, the office building and the Welcome Center as well as a geo-exchange well field and all required infrastructure such as roads, parking and site work,” said Bruce Cass, Director of Osage Nation Tribal Development and Land Acquisition Department. The other offices to be located with the ONPD are the Treasury office, Attorney General’s office and Emergency Management. Construction has also begun on the Welcome Center that will sit adjacent to the ONPD. The basement was recently completed. The center will house the offices of Constituent Services, Human Resources, Tax Commission, Planning and Grants, CDIB/Membership and the Osage News. “The plan for the campus upon completion is to have approximately 15 buildings in the overall plan, however, this is a living plan that may evolve over time,” Cass said. Currently the construction site looks like mounds of earth moved and placed in various areas covering a space of about two football fields. To the north of the construction site is senior housing and the Nation’s child care facilities. To the south is the current Osage campus. To the west is the Pawhuska Cemetery and to the east is Grandview Avenue and residential housing. Silas Satepauhoodle, who is the Field Superintendent for the project, said the Shipping and Receiving department, parking for government vehicles, maintenance department, will all be located across from the cemetery making for easier access from roads to the west of campus. The current pond that sits by senior housing will be landscaped and a walkway added. The walkway will go throughout the campus. Prior to construction, Tulsa-based geotechnical engineering company Terracon Consultants, Inc., completed an analysis of the soil conditions on the campus. The test was conducted by core drilling and analyzing the samples taken during drilling, Cass said. Terracon drilled 53 borings, or wells, on the campus, all to gauge and evaluate the best places for construction of buildings, parking and other site work, Cass said. Tests performed on the soil include: subsurface soil and rock conditions, ground water levels, earthwork, lateral earth pressure parameters and foundation design and construction, floor slab subgrade preparation and pavement design and construction. The Penta Bulding Group is in charge of construction and for job opportunities on the site contact the Osage Education Department at (918) 287-5300. 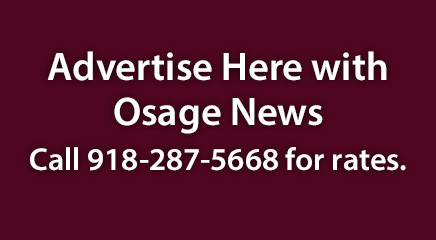 For live coverage of the construction site, visit: http://www.osagenation-nsn.gov/what-we-do/tribal-development-land-acquisition-department/osage-campus-master-plan. To view more photos from the construction site, visit the Osage New Flickr page athttps://www.flickr.com/photos/osagenews/sets/72157645442980719/.